Cabinet Construction - Highly Durable. Designed with extensive use of food grade material, including many Stainless Steel for internal components. Independent Electric turning systems for Setter compartments. Floor space, free of obstacles for easy cleaning. 4 Heaters, each of 500 watts (per compartment) Electrical requirement for a machine (of one compartment) is approx. 3 KW for a Setter. When the incubator (Setter or Hatcher) has once acquired its working Temperature, the electric requirement will be 1-2 KW per compartment/machine. Calibrated Thermometers of highest accuracy installed behind glass window for reading Temperature and humidity in the cabinet easily, without opening the doors. Robust and compact reduction gear box driven by 1/2 HP Motor. The electric timer operates the turning system automatically, every hour. The system is also provided with electrically operated rotation counter. Contact Thermometers operates automatically to control the Solenoid Valve for regulating water flow for humidifier and cooling system. 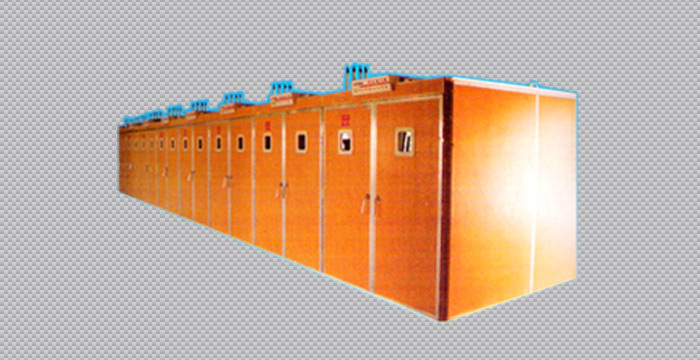 Life long STAINLESS STEEL humidity guard, is provided. Automatic Exhaust, provided for cooling system. Specially designed Plastic trays provided for easily egg setting and for extra hatchability. Electronic Horn is povided for indicating rise or fall in Temperature or failure of electric supply. The cabinet wall panels are made of fibre with thermocol insulation within and sturdy racks of thick iron painted with synthetic & with rust proof bolts and nuts. Machines can be dismantled to facilitate their passages through a normal size door. Automatic Cooling System comprising copper pipes and controlled by thermostat through Solenoid Valve, is provided.